There is a long standing joke about the lack of sunshine in Scotland. 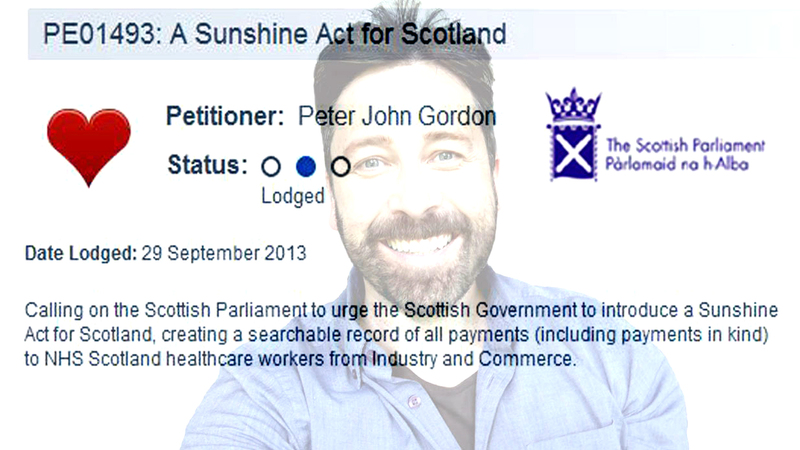 Three years ago I began the process of raising a petition with the Scottish Parliament to urge the Scottish Government to introduce a Sunshine Act. A Sunshine Act makes it a statutory requirement for all payments from commercial interests made to healthcare workers and academics to be declared publically. The metaphor is that sunshine brings full light. Both the United States of America and France have introduced a sunshine act. The doctor in Gabriel García Marquez’ ‘Living to tell the tale’ says “Here I am not knowing how many of my patients have died by the Will of God and how many because of my medications”. Márquez often returns to the theme of medical ethics in his writings and reminds us that all interventions have the potential for benefit and harm. In ‘No one writes to the Colonel’, “a man [who] came to town selling medicines with a snake around his neck”. Here Márquez is reminding us of the long history of the financial opportunities open to healthcare professionals. As a junior doctor in around 2000, I was handed by a Consultant a several hundred page document entitled “Behavioural and Psychological Symptoms of dementia”. The Consultant told me “this is the way forward!” Some years on I came to realise that this document had been developed, funded and disseminated by the Pharmaceutical Industry whose first loyalty, as a business, is to its share-holders. In the wake of the dissemination of this document, prescribing of antipsychotics, sedatives and antidepressants in Scotland has been rising year on year. This has been described as mass prescribing, and is often long-term. Yet the evidence to support such prescribing is poor. There is much promotion of “partnership working” between industry and healthcare. Yet we must remember that these two partners have different aims, and it is the responsibility of healthcare workers to follow the ethical approaches central to their professions. For example, the General Medical Council is clear about what is expected of doctors in their code “Good Medical Practice”. The potential for conflicts of interest is recognised and doctors are advised “you must be open about the conflict, declaring your interest formally”. Since 2003, Scottish Government guidance has been in place to allow the declaration of financial interests of NHS staff, to their employing health boards. As a result of my petition, the Scottish Government has confirmed that this guidance is not being followed. One key area of concern is the continuing professional education of healthcare professionals, another requirement of professional bodies. In at least two Boards in NHS Scotland, continuing medical education relies entirely on the financial support of commercial interests. National and international conferences may also form part of continuing professional education. Because of the Sunshine Act in the USA, we know that a key-note speaker at a recent UK conference has been paid more than £3 million dollars by the pharmaceutical industry since the Sunshine Act was introduced. There is currently no way of knowing the scale of any payment made to a UK speaker sharing the same platform. My experience of trying to clarify if there is transparency about financial payments in Scotland has been revealing. I have encountered significant defensive reactions from individuals and organisations. There has long been a body of evidence that, for example, prescribing behaviour is influenced by commercial interests, yet doctors find it hard to accept this. This collective denial would suggest that the forthcoming (voluntary) ABPI Register is unlikely to work as many will regard it as not applying to them and will therefore opt out. As part of their consideration of my petition, the Scottish Government commissioned a public consultation exercise on a need or not for a Sunshine Act. The majority of participants expressed their view that all financial payments should be declared on a single, central, searchable register and that this should be a mandatory requirement. The forecast for Scotland looks good: sunshine.